Usually, when a perfume house decides to make “extreme” or “black” versions of fragrances, what you get is a “flatter/fatter” take on the original scent, with most of the sparkle and vivacity removed. John Varvatos has just launched Artisan Black, a “more woodsy and musky” interpretation of 2009’s John Varvatos Artisan — a scent I love. Artisan Black was created by perfumer Rodrigo Flores-Roux and lists notes of Meyer lemon, tangerine, blood orange, calypsone (a watery melon note), Murraya flower (orange jessamine), neroli/orange blossom, jasmine, Nigerian ginger, purple ginger, cardamom, coriander, Kephalis, Belambre, Boisiris (woody iris note), Serenolide (white musk), vetiver, patchouli, Mexican cueramo (wood), soft leather and Florentine orris absolute. As Artisan Black slides into its heart notes, the aromas that stand out are orange blossom and jasmine flowers — accented with crisp ginger. During mid-development (and thanks to a diffuse musk note and orris root), the perfume turns a bit “opaque” — almost powdery — but in a sultry way. Flower and fruit notes last till the extreme dry-down, and I’m happy to report that patchouli does not intrude on the show (I’m getting really sick and tired of the sanitized patchouli that’s thrown into everything these days). I have one complaint about Artisan Black: the base notes. The “woody” base notes feel skimpy, and smell indistinct, generic and are obviously phony. It would have been nicer to finish off the fragrance with some richer vetiver, and real cedar or cypress. Artisan Black is much stronger than original Artisan, and if you already own Artisan you could very well add Artisan Black to your collection without feeling you’ve got scent twins on the shelf. Artisan is light and bright, juicy and breezy; Artisan Black has more depth, feels a bit more “masculine” and has better sillage and lasting power. Artisan Black is borderline sweet, but (to me) not too sweet for summer wear, and it doesn’t smell like dessert. I like both Artisans and would happily wear either, but if forced to choose between them, I’d stick with the original formula. 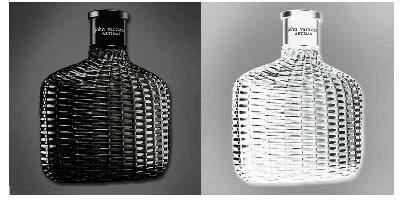 John Varvatos Artisan Black is a limited edition fragrance; 125 ml Eau de Toilette for $78. I can’t get a grasp on those bottles. Is that wicker? I haven’t tried any of the John Varvatos. I swear I saw them at Saks or Nordstrom, so I may need to check them out. Mz Kitty —I have the original Artisan and can send some with the packet I’ll be sending you anyhow—the bottle cover is wicker and it’s pretty cool…I worry that the black ones are painted and that’s going to cheapen it incredibly. I haven’t seen those bottles in person. Daisy: well they have to be painted, don’t they? No glossy black wicker out there (unless it’s plastic wicker). I saw the bottle in person and I much prefer the natural wicker bottle. the wicker could be dyed….that would look better in a finished product. I’ll wait to see them in person before I slam it too badly. I think it’s got to be dyed but to be shiny it’s got a topcoat sprayed on That would be easy enough. I still prefer the natural one—that’s part of what makes it cool. Miss K: Nordstrom has them for sure. Miss Kitty – I think they are wicker, or a coated straw-like substance. But for some reason the shape makes me think of a bootlegger’s pocket flask. Kyoot! I know I’ve seen this bottle at Nordstrom’s, but for some reason I think I’ve also seen it at Sephora. But maybe I was dreaming. No, I’ve seen them at both. Kevin —once a again your review was sucking me in with a huge whooshing sound…eyes: wide, breathing: rapid, heart rate: elevated, drool mechanism: activated! until I got to generic and obviously phony woody base notes….that’s when my vision began to clear. Still–I like the original so well that I’ll need to catch a sniff of this one. Daisy: yes, give it a try. I know we all get plenty of phony notes in every bottle…but still. I love the bottle and I actually have seen this on the Nordstroms site. I was just looking at it last night. I’ve noticed that this is the second scent for spring that has purple ginger listed. Sounds like it smells really good. I really like Artisan, so this is worth giving a try. I hope I can smell the neroli. That is one of my favorite oils to use as a base under a fragrance. N.S. : the neroli is noticeable…but there are lots of other things going on too. Gosh, I’d heard such mixed reviews of the original Artisan that I never got around to trying it. It sounds like one that my husband and I might both like. As always, thanks for your review, Kevin! I enjoy them and always learn something. I continue to grow weary of the “black” and “noir” flankers. I suppose this is a trend that sells. For some reason, the younger set finds some cachet in the absence of color? Haunani: I don’t know! Because many of the “black” scents smell less “youthful” than the originals. Hmmm…that dashes my theory, then! Interesting. I just noticed earlier that this is now at Nordstrom… I wasn’t too tempted by the announcement of this one, but as usual, you’ve changed my mind. I’ll give it a sniff next time I’m there. yup…he’s worked his “Kevin-magic” on you too…the man really needs to come with a disclaimer: caution: may incite excess spendage and unsniffed purchases. I can’t wait to try this. Loved the first, but it’s one of my “lighter” fragrances in my collection. Kev you know I loves mah sillage! I will host a split…there I said it first ya’ll. C: I think your sillage craving will be satisfied! I too thought the original was much better. I didnt enjoy the powdery aspect of this one that kevin pointed out. I’ll stick with my decant of the original, but gladly try this if/when I see it. I enjoy the original, but not too much — there are other orange/orange blossom fragrances that speak to me more seductively. Even in the original, there’s a synthetic vibe in the base (to my nose) that rubs me slightly the wrong way. It’s become a common sensitivity of mine with most traditional masculines on the market. Very much appreciate the timely review of this, Kevin! Hope you’re well. Ah, my twin. Not only the masculines, but a good number of feminines too (e.g., most of the Bvlgari line). So glad you agree with me. About the only Bvlgaris I enjoy a lot are the Tea scents. Black is okay, but a bit of that base creeps in there too and it verges on unpleasant. Joe: I’m freezing and about to do taxes…I’m not doing well! HA! Oh! Freezing! I’m sorry. We seemed on the cusp of a heatwave today: over 75°F earlier. Spring has sprung. Artisan Black is the more interesting scent but I haven’t taken the time to wear the fragrance for a few hours. The scent I currently own is Rock Volume Once. I will investigate further. Kevin, I know you would never encourage such behavior, but I did buy Ineke Field Notes from Paris unsniffed, based on your review and various comments. Oddly, I’m glad that I did not sniff it first. It has an accord that both attracts and repells me (probably something to do with the patchouli), so I might not have bought it if I’d only tried a little sample. I keep coming back to it, though, and I know I will wear it a lot. The nose is a funny organ! Thanks for all your reviews, be they tempting or cautionary! Nozknoz: sometimes those types of scents (sort of like, sort of hate) come to be the ones you love most. I hope so!